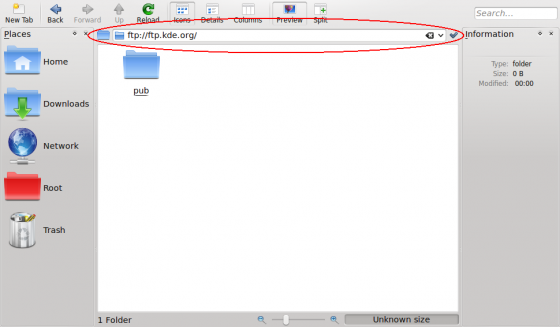 This tutorial describes how to transfer files to and from a remote server using the KDE Software Compilation. This might mean downloading a file from a FTP server or saving a file over SSH. 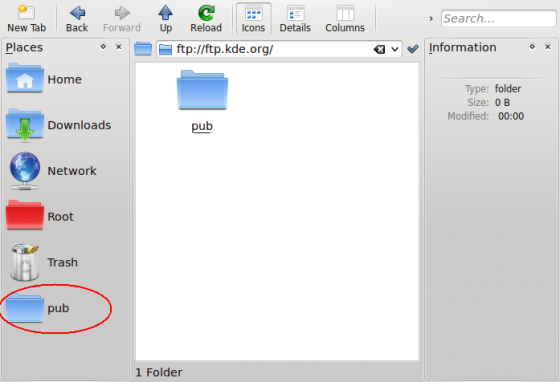 The KDE SC does not include a standard FTP client as you may know it from other platforms. 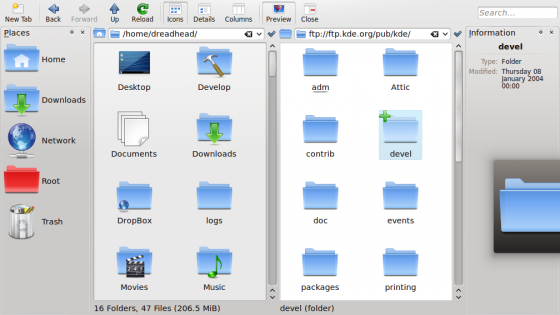 There are some third party applications like Kasablanca or KFTPgrabber but they are not yet fully ported to the KDE Platform 4. The good news however is, you don't need such an application to manage files on your remote servers. The KDE platform features a far more powerful technique for dealing with such situations. To connect to a remote server you can use almost any KDE application. You may choose the appropriate application depending on the task you want to do. For example, if you wanted to browse a remote server the best choice would be Dolphin or Konqueror. To edit a webpage you can directly use Quanta without the need of a separate FTP application. In this example we will use Dolphin and transfer files using FTP. If your server requires authentication you will be prompted for your credentials in a popup dialog. Enter your username and password. If you wish to save them, check the relevant checkbox. Dolphin will store your passwords securely in your KDE Wallet. For faster access you can insert the username and password directly in the address bar using this format: ftp://username:password@ftp.myserver.org; however we do not recommend this, as it is a security risk. Not only is it visible in your location bar, but it is stored in plain text, and so can be easily read by anyone with access to your home folder. Storing the password in KWallet is much safer, providing you have protected your KWallet with a password. ...and then on the ftp button at the beginning. The protocol selector should appear similar as shown on the next screenshot. What protocols are available on your system, depends on which KIO plugins you have installed. Note: Due to KDE bug #55804, files moved or copied from the local machine to a remote machine via the fish protocol have the wrong timestamps. A workaround is to use SFTP for transferring files to another machine. You can now edit the file in Kate. When you click Save the file will be directly uploaded to the server. That way, you don't need to download files before editing and upload them again after editing. You probably miss some settings seen in standalone file transfer clients now, such as switching active and passive mode in FTP or timeout settings for your connections. Don't worry, you can find them in System Settings under Network Settings. The Connection Preferences section may be especially useful. This page was last modified on 5 October 2010, at 14:35. Content is available under Creative Commons License SA 4.0 unless otherwise noted.